The beginning of 0101 Music gave an insight into just how imperative the label was to become within the independent drum & bass world. Launching off the back of Maztek’s ‘Warpath’ LP, its motives were clear from the outset. It also set a standard for the creative freedom which would not only be afforded to Maztek, but to the artists who Maztek brought into the imprint for its widening collection of releases. Leading the label’s charge, Maztek has his own decorated history within the genre so it made sense for him to engineer his own platform in which to showcase the music he recites during his global touring schedule, as well as the artists which have given him inspiration in the last few years of his career. For the next release on 0101 Music, Maztek delivers an EP from Ukrainian and Russian duo Bad District. Having garnered the interest of tastemakers on the likes of Bad Taste and Major League, they’re about to expand their influence even further. However their sound has already been seeping into the sets of supportive heavyweights such as Noisia and they’ve been premiered on the pivotal Rene LaVice BBC Radio 1 show, which has gained them access to an even wider audience. And this is just one more reason why their forthcoming ‘Hyper Drone’ EP is another big endeavour for the 0101 Music moniker. Whether it’s the riotous percussive slabs of ‘Hyper Drone’, or the steppy beats and throbbing drum sequences of ‘Charger’, neither member of Bad District water down their sonics for this offering. ‘Lost Control’ alludes to its name through a winding bassline and cutting kicks, dropping you thick and fast through distorted metallics and a snaring groove. Then ‘Voodoo Hardware’ follows its sweeping atmospherics with cutting stabs which add to the track’s unforgiving mix. 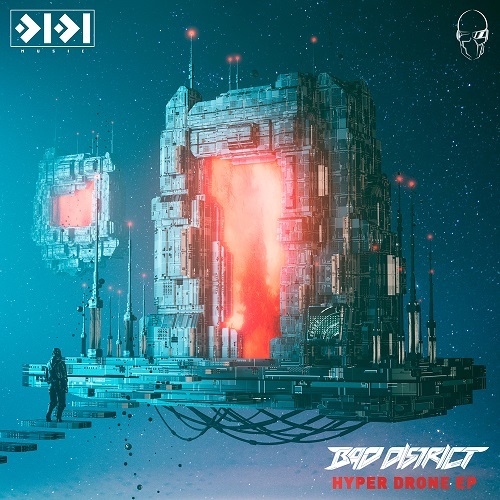 The EP fully encompasses Bad District and what they’re about as drum & bass producers. They share the same ethos as Maztek, which is why he’s brought them into the 0101 Music roster without hesitation. A final step towards the New Year, it’s an EP which will realign listeners with what 0101 Music has given them since its creation. Bad District = Andrew Markham + Stephen Facade Andrew is from Ukraine and Stephen from Russia, both guys first demonstration of their musical talents was in legendary russian Neuropunk Podcast by DJ Bes 1\2 Gydra. After first Andrew solo tune Steampunk in Neuropunk he produces for TAM Records Pandorum EP and after its release he started to form Bad District project with Agnostectics & SVJ, they produce Evol Intent ft. Blip – Flipside (Bad District Bootleg) which start their neuro way and continues with releasing Get Out EP on Evol Intent Recordings, during some time they join Bad Taste and release massive Bluff EP with supports of Noisia, Neonlight, Ed Rush, Jade, Drumsound & Bassline Smith, State of Mind, A.M.C, Mind Vortex, Mindscape, Maztek and others. Due to some changes in team, Stephen joins BD and project continue its way as duo. Stephen joined Bad District after his collab with them called “Prey” from Bad District EP on Major League which get lots of support by DJ’s & producers all around world and was premiered at BBC Radio 1 Drum & Bass Show by René LaVice. Now you can see & hear the result of this cooperation from verу bad district.